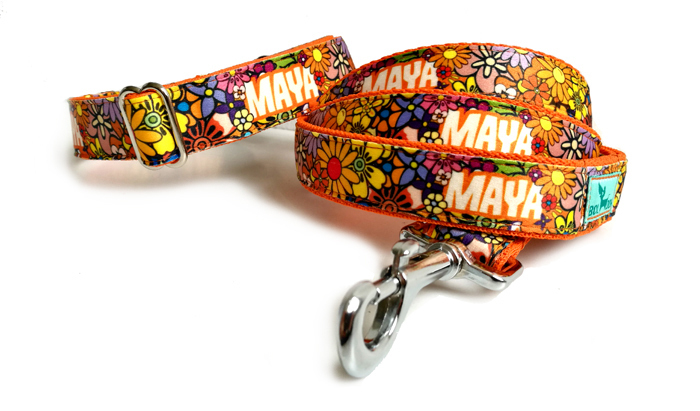 The embellishment of this leash is entirely identical with the base color of the collar and the pattern of the ribbon. The length will be 120 or 150 cm which can be modified upon request to shorter or longer. The embellishment of the handle was made to be identical with the base color of the leash and with the pattern of the ribbon. The length will be 120 or150 cm which can be modified upon request to shorter or longer. The length of this type can be adjusted with the help of the 2 carabiners and the rings between them at the end of it. One side is set with patterns. The average length is 200 cm. At the three types leash one end of the leash there is a carabiner, and a welded hoop on the other end where the handle is, which you can attach to yourself if the dog is off leash. Underneath the Bol-Dog logo there is a small pocket to which you can hook the waste sack or pull a plastic bag through it if needed.